All transactions are safe and secure with a reliable history in online purchasing behind each of our associates. Buy the Exercising Kenny Powers t-shirt to own Eastbound and Down clothing and merchandise. This tee celebrates Jefferson Davis Middle School's most notorious substitute physical education teacher, Kenny Powers. 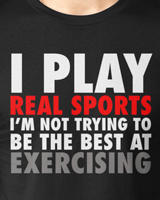 The design conveys his position on exercising, "I play real sports. I'm not trying to be the best at exercising." Wear it to relive this and other Coach Powers' quotes from your favorite Eastbound and Down episodes. Grab this Kenny Powers tee to cheer on the legend, or put it on with your Kenny Powers costume. Pair it with a Jefferson Davis Eagles t-shirt to celebrate the only school willing to give him a job. In addition to the Exercising Kenny Powers tee above, browse the Eastbound and Down Clothing Gallery for more apparel like men's and women's clothes, kids shirts or hoodies.